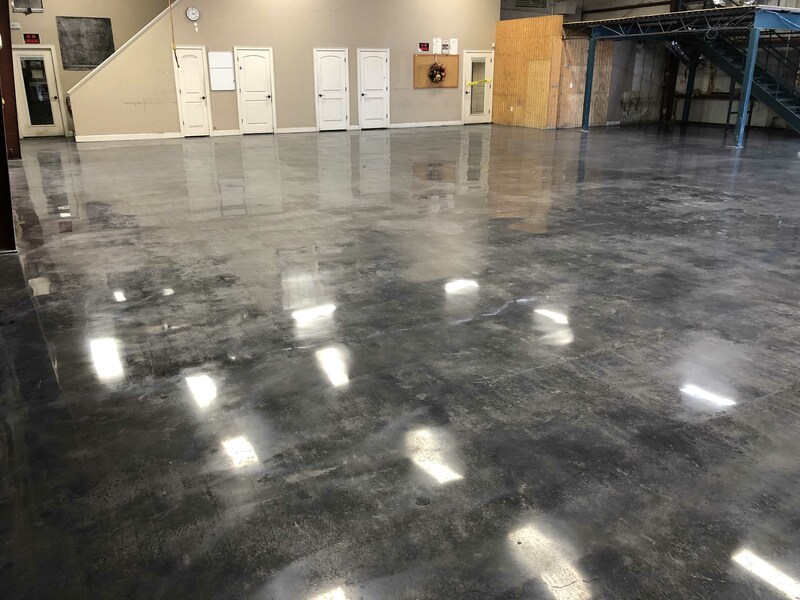 Maintenance of polished concrete floors is an easy task and if done on a regular basis will help preserve the polished finish for years to come. If you have polished concrete floors you know they can be easy to maintain if they have a smooth finish. If they aren’t that smooth, it could be a little more challenging to keep them clean. At the minimum, polished concrete floors should be dust mopped daily if possible, and mopped with a neutral cleaner about once a week or more if there's heavy traffic. No matter if you have polished concrete in your home or in your large industrial setting, if you implement some of these ideas to your polished concrete floor, it will go a long way in maintaining the polished finish for yours to come. Install walk off mats at all the entrances of the building, as this will reduce the amount of outside debris to fall off and not tracked on the polished floor. This can be especially important in cold weather areas where salts are used to melt snow. The salts can be damaging to a polished concrete floor and every effort should be made to minimize exposure to them. Also very important is cleaning of spills right away. Although polished concrete is less porous than non-polished concrete, polished concrete is still porous. If the spill isn't cleaned up in a timely manner, there is the possibility of staining to occur. Dust mopping daily will help keep dust, sand, dirt, and any other debris from slowly wearing down the polished finish. 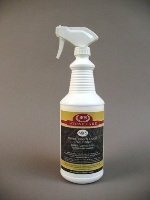 If done daily it can be quick and very beneficial for maintaining the polished finish. Lastly, scrubbing and/or mopping regularly is very important to keeping your polished concrete clean from sand, soil and grime. You may have heard polished concrete is maintenance free, and that is just not the case. Scrubbing and/or mopping is very important and should be done periodically on a timely schedule. If you have a large commercial concrete floor, you most likely have a autoscrubber which is equiped with the proper brushes or pads for cleaning your polished concrete floor. Autoscrubbers can make quick work of scrubbing your polished concrete floor. If you don't have an auto scrubber, then you follow the steps outlined below for mopping and keep them lookng great for years to come. 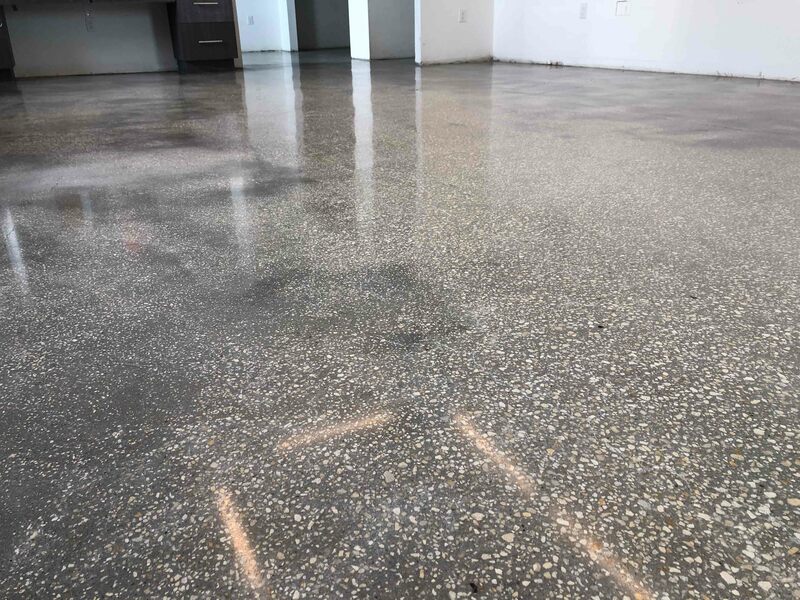 If you have polished concrete floors in your home, office or commercial building, here are some steps you can take to help keep them looking great. 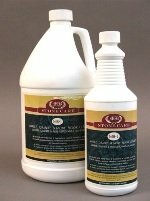 If you don’t already have a neutral cleaner, you should buy some, especially if you have polished concrete floors. A good neutral cleaner will clean your floor, but not expose your concrete floor to harsh alkaline or harmful acidic chemicals to your floor. The great thing is, neutral floor cleaners can be used on all flooring types. Sweep, dry mop or vacuum the entire floor. Dilute your neutral floor cleaner with water in a bucket or container of choice. 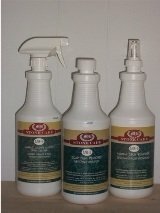 Wet your microfiber mop or traditional mop with your neutral cleaner solution. 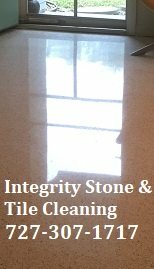 Mop your polished concrete floor. Let your mopped floor dry. Maintenance of polished concrete floors is that easy! When it comes to maintenance of polished concrete floors or refinishing of terrazzo floors, we strive to help educate our customers on the best protection they can have, helping them save time and money in costly restoration costs down the road. 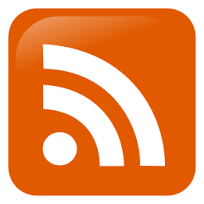 We offer our services throughout the Tampa Bay Area, Florida.